It has been quite a long time since I posted something new. It had been a very busy month, dotted with bouts of sickness. The cold weather which is slowly sneeking into this part of the world along with the flu virus, did give me quite a number of headaches. So, my expriments in the kitchen swayed from wild and wacky to bland and pure, in accordance to what my tastebuds craved. Wow, what a month it was! I feasted on plain steamed Basmati rice with steamed vegetables and loved the taste of it. The same could be said of pureed rice with buttermilk, and rice rawa porridge. Certainly bouts of sickness make me appreciate the taste and texture of food better. Last week, on our grocery shopping I was shocked at the increase in rice prices. The rice variety in question being Sona Masoori. A little search threw me the news of ban on non-basmati rice varieties and also the news of the partial lift of the ban. News here: http://www.business-standard.com/common/storypage_c_online.php?leftnm=11&bKeyFlag=IN&autono=29218 Back to long grained rice in a short while, should I say? On a side note, Padma of Padma’s Kitchen sent me the Amish Friendship bread starter and I made a batch of bread. It turned out delicious. However I could not send the starter packages on time and hence have started the second batch. I will post on the Amish bread pretty soon. Ok..enough of notes.. 🙂 Last week, for the first time, I made Aatukkal paaya which roughly translates to ‘Goat Leg Soup’. Back home, my dad gets smoked goat legs from our local ‘Baai’ and mom pressure cooks them in water laced with turmeric and salt and keeps them in the fridge overnight. Here, I made the Paaya the same day. Cook the mutton legs in water with turmeric and salt. Fry Coriander seeds and black pepper in ghee and grind to a fine paste using a little water. Crush the garlic flakes. Heat the oil and fry onions till light brown. Add the garlic d and fry till very light brown. Next add the tomatoes along with a little salt and chilli powder. Fry till the tomatoes turn mushy. Next add the goat legs along with the water it was cooked in. Let it thicken a bit. And then add the ground paste, curry leaves and coriander and cook till the gravy thickens. Serve with steaming hot idlis, dosas, aappams or rice. Note that my recipe does not use any cinnamon, cloves or other spices. The gravy derives its flavor only from coriander seeds and black pepper. In Tamilnadu, Aatukaal Paaya is supposed to be good for recuperating patients and is a regular feature in their diet. 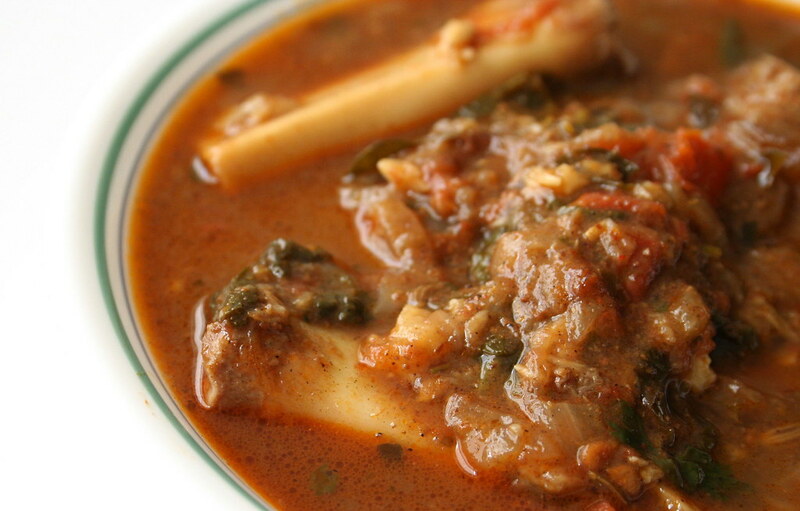 Check out another Aatukkaal Paya recipe at Joseph’s Kitchen. It’s JFI time again and lovely host Mandira has chosen the ubiquitous fruit Banana to be the star this month. Banana is rich in potassium and is a powerhouse of energy. A glass of milk and a banana forms a complete meal. My original choice for JFI – Banana was a Banana Cream pie from one of my favorite cook books. But there has been a surge in the number of sweet items I am baking and cooking nowadays and for a change I changed my choice to a savory recipe using Plantains. Peel plantains and slice into thin rounds. Use a mandoline if possible, as we need really thin slices. 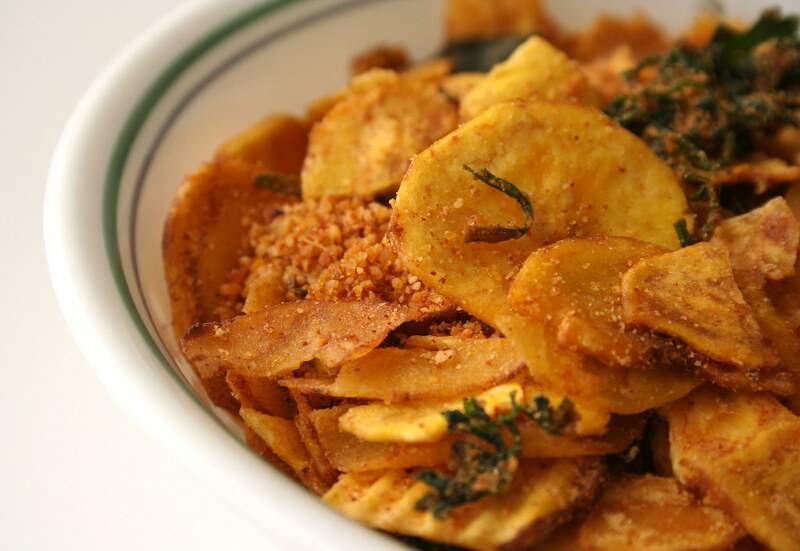 Add a generous amount of salt to the plantain slices and mix thoroughly. Set aside for about 5 to 10 mins. Then wash with water and drain thoroughly. Spread on a cloth and let it dry for 25 mins. Deep fry in oil and set aside. Next, roast channa dal, urad dal and jeera, one after the other, till light brown. Fry dry red chillies and garlic in a little oil. Grind all of of it together. Heat oil in a pan and add curry leaves and coriander. Fry till they wilt. Add the ground powder and fry. But do not let it brown. Add the plantain rounds, reduce heat and stir gently to mix with the rest of the ingredients for about 5 mins. Remove from heat. Serve with hot rice with drop of ghee or as a side dish. 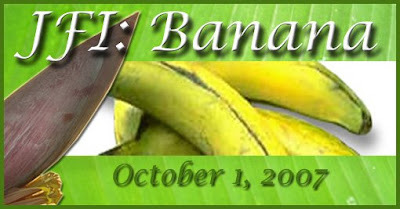 Check out information about bananas here.